It goes without saying that each generation gets the pop stars it deserves. Of the ones remaining and still performing, Madonna, Boy George and Prince belong to what could be called my era, not too shoddy. This current batch of kids will eventually become nostalgic about Beyonce, Adele and, I’m sorry, One Direction. In the last five years Taylor Swift has been riding their coat-tails with her persistent country -pop and, for better or worse, she may turn out to be the biggest pop star of them all, certainly of 2014. “1989”, Swift’s fifth album, is not only the year of her birth but also refers to the eclectic and idiosyncratic musical chart toppers of that same year, part of my era, and which allegedly inspired her to finally, and somewhat predictably, make the full transition to that of a pop star. Max Martin has produced and written for the cream of Billboard magazine’s sweethearts over the past decade and a half and Swift called on him to help with a clutch of songs for her last album, the gazillion-selling ‘Red’. Those tracks were the ones that provided the album with a contemporary pop sheen, dubstep and more heavily electronic soundscapes featured, and some of its biggest hits. Martin returns here with the weightier task of almost full production responsibilities of “1989” and co-writes with Swift herself. He does a consistently robust and appropriately timeless job here and, between the two of them, the songs are frequently sharp, smart and exhilarating and avoid any of the obvious potential pitfalls; no features, no EDM and no Dr Luke. The best moments here, and there are many to choose from, are the more thundering and urgent guitar, drums and synth tracks that call to mind pop acts such Go West, Simple Minds and Kelly Clarkson. “Out of the Woods” is not only the biggest success here, Swift’s sneer is surprisingly apparent and the gulping repetitive chorus is perfect, but almost the most lyrically competent and stylish. “All You Had to Do Was Stay” with its cheeky vocal nod to the Eurythmics, “I Wish You Would” and “Bad Blood” all provide rollicking middle-eights, tight arrangements and artful choruses that all make the intended impact. “Style” is an elegant mid-tempo electro soon-to-be chart topper which offers up the hookiest chorus – and that’s saying something here – and “Wildest Dreams” is as close as Swift gets to a mood piece although it owes quite a debt to the omnipresent Lana Del Rey sound. 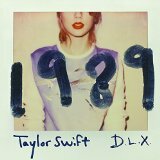 The rest of “1989” is serviceable enough but lacks the passion of the better tracks and struggles to live up to the album’s conceit. “Welcome to New York” is not only one of the very worst, most insipid songs written about the city – and also a rare moment when the album also slips into musical parody of the period it’s influenced by – but it is almost a genuine reflection of it as seen through the Swift’s eyes as a recent, over-excited new comer. It also highlights just how bland and naïve lyrically many of these songs are; Starbucks lovers, it’s all good, haters and players and “How You Get the Girl”, even if used with irony, make the album sound like a massive corporate tie-in with a particular brand of young girls who can afford to live in a big city. Since the album’s release Swift has indeed, and not without controversy, been appointed as an official ambassador of New York; it wasn’t like this with Debbie Harry. If Swift were to be a representation of the very best that pop could offer in 2014 then “1989” would confirm that pin sharp songwriting and hooks were still in abundance and lush, enveloping production was of a consistently high standard. But within the genre that is only one part of many essential components. Her previous albums have been built on an authentic and believable persona where it was possible to identify the style of the song – the actual sound of it – with the singer; here she sounds technically proficient but for the main part generic. The major players of the last thirty years right up to and including Beyonce and Adele have all developed a sound that is quintessentially theirs but Swift has failed to do that here; there is nothing exceptional or original about the way “1989” sounds. It is unlikely that her next few records will see a return to country music so maybe they will continue to build on Taylor Swift’s respect for pop and see her as confident enough to be as unpredictable and individual as her idols; or maybe she is readjusting the standard.